Even people who love to entertain can be overwhelmed by the task of hosting a Thanksgiving dinner for family and friends. Let’s face it: Many of us have the image of Norman Rockwell’s Thanksgiving painting seared in our memories. How can anyone live up to that? Even if you have the most magnificent kitchen in all of Naples, it’s still a daunting task. Relax! Here are some tips on how to host Thanksgiving at your Naples home that will make things a lot less stressful. Planning your menu ahead of time takes a lot of the stress out of Thanksgiving dinner. Make up a menu and don’t go overboard. We’ve never heard of someone leaving a Thanksgiving meal having eaten too little. Knowing what you’re going to make will ensure that grocery shopping is a lot easier. Think about who will be coming and what they like. Remember: It’s NOT about proving that you’re a gourmet cook. It’s about enjoying friend and family time with people you care about. One big challenge on Thanksgiving Day is trying to get everything done at the same time. Think about your menu and figure out which items (side dishes) you can fix ahead of time. Even if you have to heat them up on the day of the feast, at least you’ll have the preparation work done ahead of time. Some hosts and hostesses make their appetizers so intricate and filling that their guests are full before they get to the table. Try to keep things a little lighter. It’s better to serve light fare before dinner that whets the appetite—instead of sating it. An advantage to good appetizers is that they keep guests occupied while you’re working in the kitchen. If possible, prepare these items ahead of time. Sure, stuffing is almost sacred in some circles and is an essential element for any Thanksgiving dinner. But there are some pretty awesome store-bought stuffings out there. You can add your own special touch with spices or garnishes, but don't stress out over the stuffing. With the amount of food most of us have on the table (and the variety of flavors) no one is likely to know that you supplemented a box mix. A lot of Thanksgiving sides and appetizers cook at 350 degrees. That means your oven can do double duty. Cook multiple dishes at a time. Just be sure to program separate timers and add extra minutes to account for the oven door opening. Here’s a tech tip: If you have an Amazon Echo (or similar device) you can set multiple timers/reminders. That frees you up to focus on other things! Many guests love to take leftovers home with them. You don’t need to be scrambling to find containers after the meal. Start saving reusable containers now. And make sure your shopping list contains resealable bags that guests can use to take leftovers home. 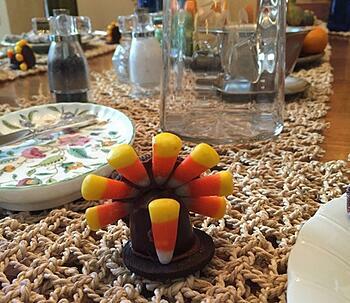 Here’s a simple table decoration/extra dessert item that will leave people smiling. It’s simple to make. It’s nothing more than an oreo cookie (with the filling scraped out) and a chocolate-covered cherry, some candy corn, and a bit of chocolate frosting to hold everything together. Guests can either eat them as dessert or take them home (and eat them later). It’s a fun reminder of the good time they had at your Naples home on Thanksgiving!